Scooter’s Spaghetti with Zucchini Noodles is a low-carb makeover of a popular spaghetti casserole called Scooters Spaghetti. The sauce and cream cheese remain the same, as well as the distinctive french-fried Onion Rings on top. Scooter’s Spaghetti appears to be one of the rockstars of this blog. Please forgive me for bragging that it has had over 450,000 pins according to Pinterest. Just when I was feeling kinda proud about that statistic, my 7 yr. old grandson tells me this past week that he likes spaghetti and meat sauce but he doesn’t care for Scooter’s Spaghetti because of the “white cream stuff in it.” Way to slam the oven door on my souffle! I’m convinced that God uses children to gently keep us humble. As you can imagine, especially if you are a food blogger yourself, I’ve had a lot of comments and questions over the years about what to substitute for this or that ingredient people don’t care for. One of the most popular substitutions in this recipe is zucchini noodles, sometimes called zoodles, for the spaghetti. Reports back were positive so I couldn’t wait to try it. My first attempts were disappointing. The noodles were watery. Solution? Three ways to remove excess moisture from this dish. #1 Remove as much water as possible from the zucchini noodles themselves. Salt well and roll them in a large fluffy towel lined with paper towels. Let sit for 20-30 minutes. Then I put the rolled-up-in-a-towel noodles on a tile floor and step on them to squeeze out as much water as possible. Think Lucy and Ethel stomping on grapes. The towel should be pretty well soaked. Unroll and use the “zoodles” as is. No need to pre-cook. Don’t worry, this can be done ahead of time. #2 Alternately, place the noodles in a large, hot skillet and sauté just until the liquid starts to ooze out of the zucchini noodles. Place in a strainer and press as much liquid out of them as you can. #3 Ensure your sauce is very thick. You could cook it down for 30 minutes or so, but I think it’s faster to strain it. I use an industrial size coffee filter inside a cheap colander. This is the first thing I do when I start to make this recipe so it will be thick by the time I get ready to assemble the casserole. Between the cream cheese layer and the onion rings, they are what make this recipe memorable. There are only 3 carbs in 2 tablespoons of the onion rings so I use them. Without them, this dish just isn’t the same. However, if you are needing a gluten-free entree, you could easily substitute pan-fried shallots for the onion rings. (See picture below). You will need at least 4-5 shallots for this recipe. I tried doing the same thing with regular onions, but they wouldn’t get crispy like the shallots did. My favorite marinara for this spaghetti is the Victoria White Linen brand which I buy at Costco or get from Amazon. It claims only 6 grams of carbs for a 1/2 cup serving, and sugar is not found on the ingredient list. The label also claims no water has been added–a good thing whenever you are cooking with lots of vegetables. Pour marinara into coffee filter or paper towel-lined colander to strain off excess liquid. 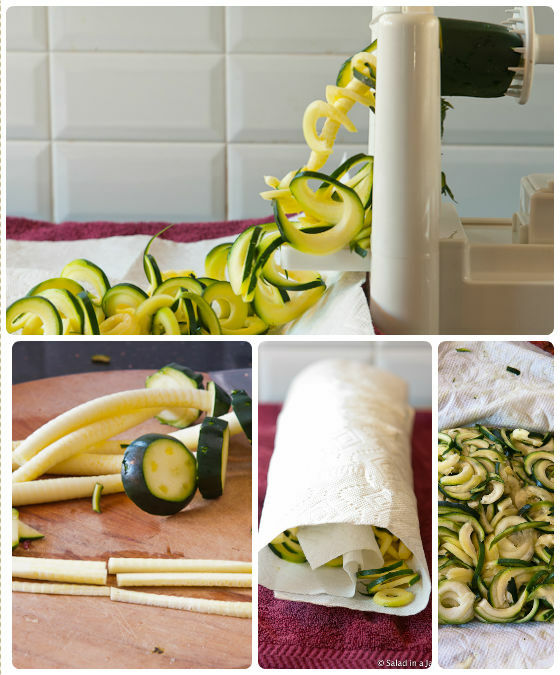 Spiralize 6 zucchini. Spiralizers vary but I use the larger spaghetti noodle shape. The most narrow noodle on my machine also works well. Salt heavily (approximately 1 tablespoon of salt). Wrap salted noodles in paper towels, then in a large bath towel. Set aside for 20-30 minutes minimum. Apply pressure on top of rolled-up towel to squeeze out as much moisture as you can. Brown ground beef. Drain excess grease. Add onions and fry until softened. Add drained marinara to beef and onions. If still watery, cook until sauce is very thick. Set aside. Add butter and bell peppers to a microwave-safe glass bowl. Cover. Cook on HIGH for 2-3 minutes until peppers are softened. Add cream cheese to bowl and microwave for another minute or until cheese is soft enough to combine with veggies. 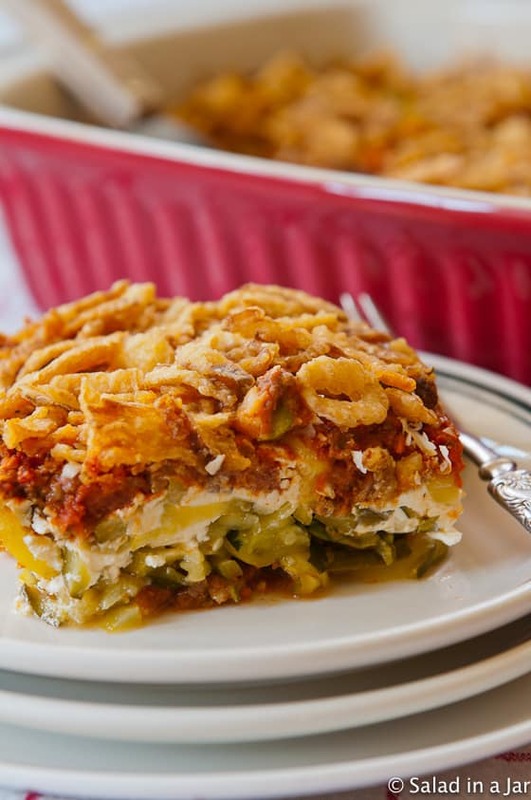 Cover the bottom of a 9 x 13 -inch casserole dish or pan with approximately 1/2 cup of meat sauce. 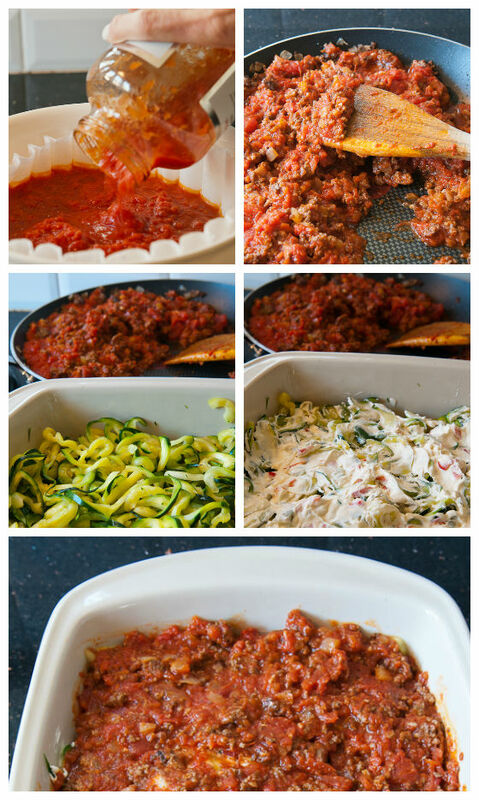 Layer zoodles on top. Spread cream cheese mixture over zucchini. 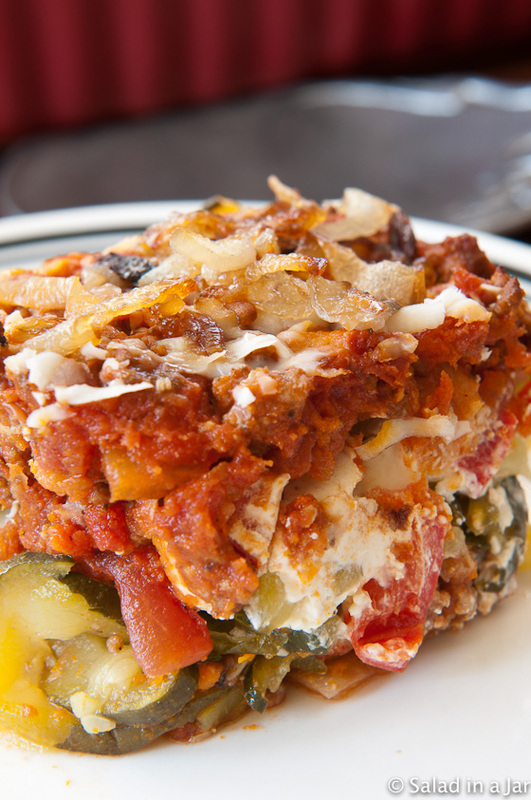 Carefully pour meat sauce over cream cheese layer. Sprinkle with grated Parmesan cheese. Can be made ahead of time up to this point and refrigerated. Bake at 350 degrees for 30 minutes or until hot throughout. Add more time if dish has been in the refrigerator. 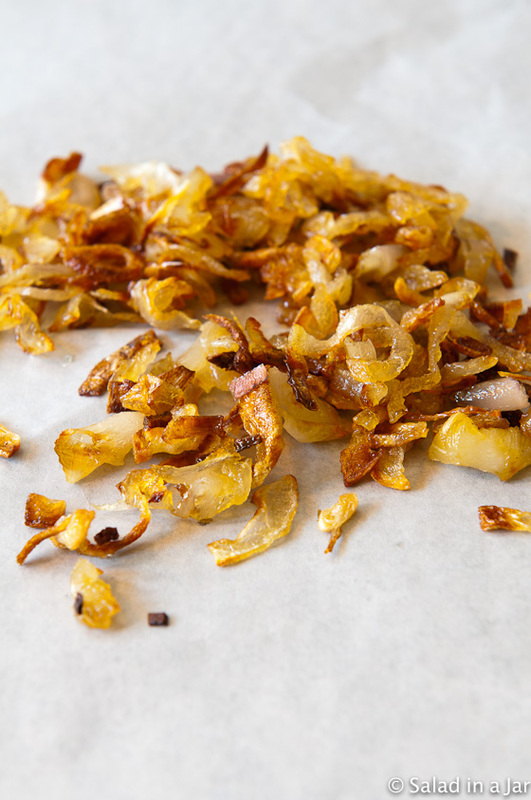 5 minutes before completion, sprinkle french-fried onions over the top of casserole and put back into the oven to brown. Watch closely as the onions will burn easily.